Well folks I’m on round two of the Whole 30 diet, so the next month of posts will most likely be all natural, clean eating meals that are low-carb. This BLT Quiche with Potato Crust is the perfect make ahead breakfast Quiche for those of us on the Whole 30 meal plan or low carb diet. I made it on Sunday and have been eating it all week. I almost think it gets better as the days pass. 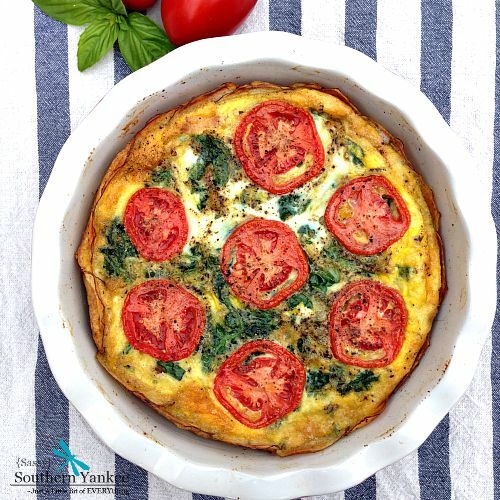 If you are looking for a quick and easy breakfast during the week give this BLT Quiche with Potato Crust a try! To get things started wash the potatoes and slice into thin rounds. I used a mandolin set to 1/32 inch width, but you can just cut them super thin if you don’t have one. Grease a pie pan with some bacon fat (if you are eating Paleo like me and have it saved) or any non-stick spray. 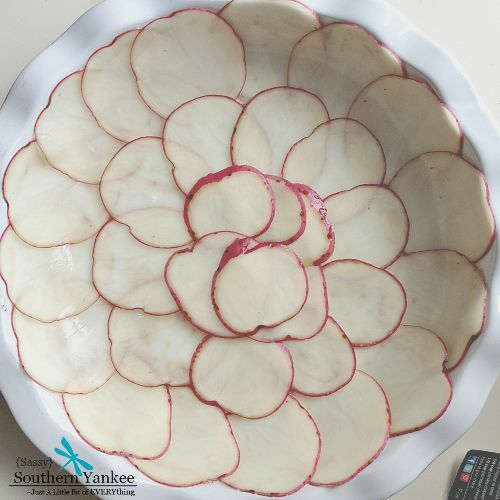 Line the pie pan with the sliced potatoes making a “crust”. Sprinkle a pinch of salt and pepper over the crust. in a skillet add the bacon and cook over medium high heat. Once the bacon is almost to your desired doneness add the onions; cook the onions until they become translucent. Using a slotted spoon remove the bacon and onion mixture and evenly spoon it over the potato pie crust. Using the pan you just removed the bacon from add the spinach, salt and pepper; sauté the spinach until its wilted. It’s amazing how quickly 6 cups of spinach will reduce to 1 cup cooked isn’t it? Using the slotted spoon again remove the spinach and evenly spoon it over the bacon and onion mixture. 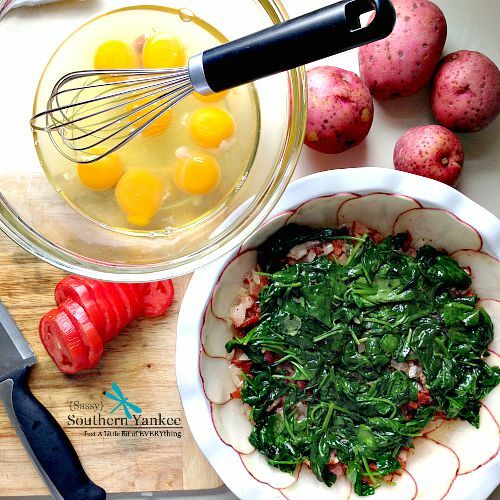 In a medium bowl whisk the eggs until they are creamy and smooth; pour the eggs over the spinach. To finish things off slice the tomatoes into 1/4-1/2 inch rounds them place them on top of the Quiche. Bake in the oven at 375* for about 30 minuets until the eggs are set. You can serve warm or chilled. I drizzled a bit of olive oil on the top before serving and added a bit of course salt and pepper. This BLT Quiche with Potato Crust is the perfect make ahead breakfast quiche for those of us on the Whole 30 meal plan or low carb diet. To get things started wash the potatoes and slice into thin rounds. I used a mandolin set to 1/32 inch width, but you can just cut them super thin if you don't have one. Grease a pie pan with some bacon fat (if you are eating Paleo like me and have it saved) or any non-stick spray. Line the pie pan with the sliced potatoes making a "crust". Sprinkle a pinch of salt and pepper over the crust. Using the pan you just removed the bacon from add the spinach, salt and pepper; sauté the spinach until its wilted. It's amazing how quickly 6 cups of spinach will reduce to 1 cup cooked isn't it? Using the slotted spoon again remove the spinach and evenly spoon it over the bacon and onion mixture. 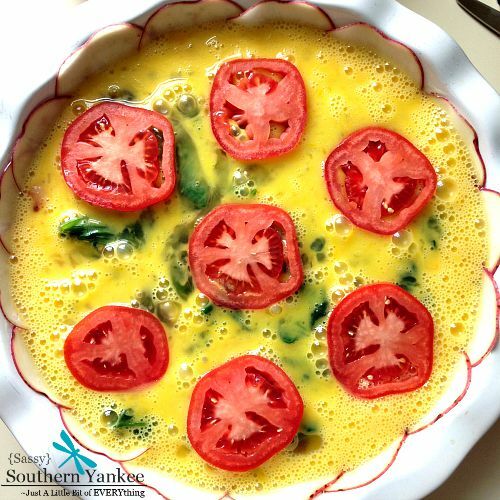 To finish things off slice the tomatoes into ¼-1/2 inch rounds them place them on top of the Quiche. Bake in the oven at 375* for about 30 minuets until the eggs are set. You can serve warm or chilled. I drizzled a bit of olive oil on the top before serving and added a bit of course salt and pepper. 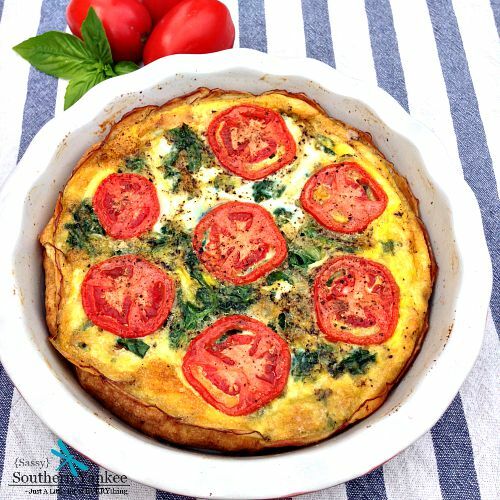 This entry was posted in Breakfast, Main Course and tagged Bacon, BLT, Brunch, Easy Breakfast, Easy Dinner, Farm to Table, Low Carb, Make Ahead Breakfasts, Quick Breakfasts, Spinach, Summer, tomato, Tomato Pie, Whole 30, Whole 30 Meals, Whole 30 Recipes. Pingback: Celebrate Your Easter With These 19 Great Brunch Recipes! Pingback: Need A Perfect Easter? These 19 Great Make-Ahead Brunch Recipes Will Do It! I have made this several times and it is wonderful! A keeper for my family! Tried making this and failed miserably. Eggs leaked through the potato crust potatoes therefore didn’t crisp up and barely cooked. Eggs got overdone. And I’m guessing I just got some really ripe tomatoes cuz the entire center looked juicy. Luckily it still tasted great! Ha. Any tips on making it so the eggs don’t penetrate the crust? Made it last night and it was fabulous. The egg came through my potato slices a little where the holes from my spiralizer are, but I used a stone (pampered chef) quiche pan, checked the center with a knife, let it cool a bit and it set up just fine. This is awesome! My whole family loved it. This is a great recipe. Easy to make and very inexpensive. I left out the spinach because it adds very little flavor and a lot of cost. I used 1/2 of a 12 ounce package of bacon. The author is correct that reheating in the microwave works well with no loss of flavor. I used pealed russet potatoes. All totaled I made this recipe for under $5 and had six servings. Simple, delicious and inexpensive is the winning trifecta. Sorry for the delay Dora. Yes, this could be made without the potatoes; however I would just make sure you spray the pan with non stick spray really well to keep the egg from sticking. Made this for my first whole30 this week and it’s absolutely amazing. I usually hate reheated eggs but this has been great all week long. I’m considering making it again next week and adding mushrooms. Thanks for a great recipe! I made this for my family for dinner tonight. It was delicious! And I made a second one using chicken instead of bacon that turned out well also. This recipe is definitely a keeper. Thank you for sharing. Does anyone have any tips on how I can get the potato crust to crisp up? Should I cook crust 1st then add the eggs? Could you make the quiche into mini quiches in a standard muffin tin? Would love to try this recipe, doing it this way would be more convenient for me. Hey Faye, I don’t see why not! It might be harder to layer the potato crust but it should work. Maybe put a potato round on the bottom and ring the bacon around the cup like a cupcake liner? I would suggest also decreasing the cooking time and just watch them so you don’t overcook the eggs.